Decorated living room is the need and trend these days, because in this age of studio apartments we get little space for our living room. Hence perfect design helps you to accommodate all your furniture with much free space. 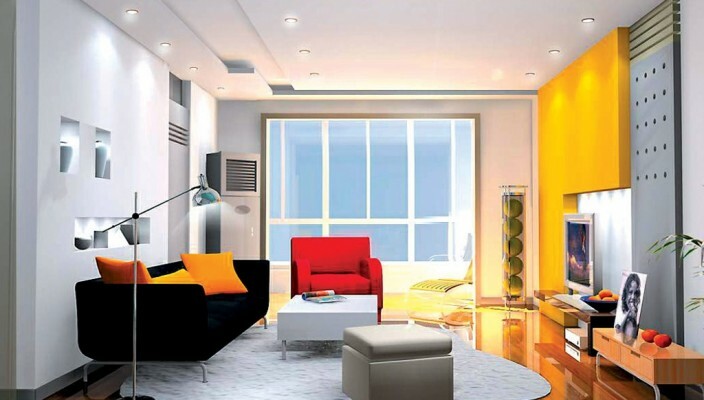 This design covers all your living room requirements and provide stylish look. Sofa set is placed exactly opposite of the television set. A wooden stand is provided to put television set. Another wooden stand is provided to put things like photo or other decorative items. This design comes with different colors for every wall. Light colors like beige, white and ivory are used, so room look larger. A French window is provided for air, light and security. A classic plaster of Paris work is provided on the ceiling of the room. Walls are provided with small compartments to put decorative things. Lights are provided on ceiling. We tried to put all things together for eye pleasing atmosphere.